Captain Cook Reef is a region in Jillaroo State in northern Irukandji. Five sims adjoin Captain Cook Reef. Clockwise from east, they are Whitsunday Island, Coolangatta, Tanawayo Bay, Jackaroo Island, and Barramundi Bay. 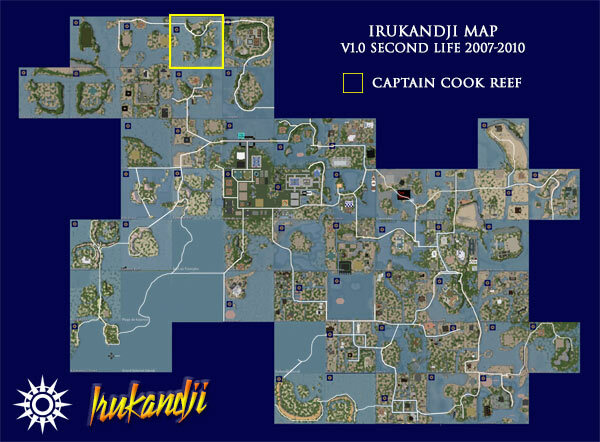 Captain Cook Reef is a light residential sim which was popular with people seeking privacy in a remote hideaway. The region was roughly 50-50 land and water. It featured a long Y-shaped spine of low hills running from north to south, with beaches on either side. Housing parcels were offered on the eastern side of the hills and enjoy full occupancy. 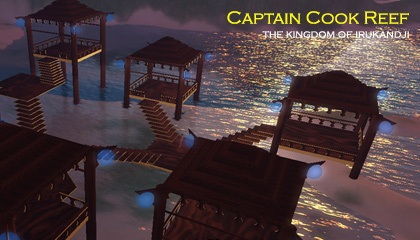 In the east, a public tiki-style village gives a pleasant romantic feel to Captain Cook Reef, particularly at night. Only one photograph has emerged of Captain Cook Reef but hopefully more will come to light over time.